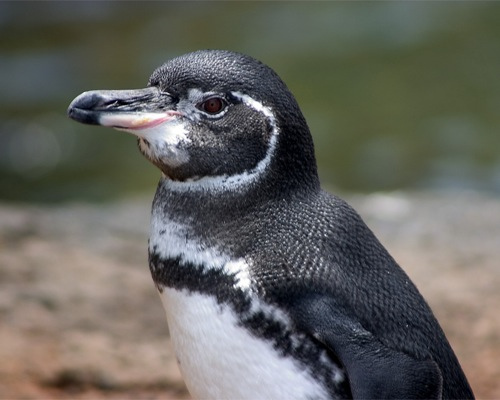 The Galapagos Penguin is the only species of penguin that are found to the north of the equator. As their name suggests, this endangered species is indigenous to the Galapagos Islands that survive mainly on the Humboldt sea current that brings in cool waters from the oceanic depths. These marine birds fall under the banded penguin species and are the second smallest penguins in the world. Some researchers suggest that these temperate penguins are the closest relative of the African Penguin, the Magellanic Penguin, as also the Humboldt penguin that are found along the Chilean and Peruvian coasts of mainland South America. Size: These birds are around 49 centimeters (19 inches) in length. Weight: On an average, their weight is around 2.5 kg (5.5 lb). Head: These penguins have a rounded black head, having a white border that runs around their head up to their eyes. Fur/hair/coat: Colors white, black and gray make up their coats. Feet: Feet are black and webbed. The feet do not have feathers. Eyes: Round to almond shaped eyes with a white to light-gray border. Bills/Beaks: Bills are strong. The upper bill is mostly black while the lower one is a combination of light orange, white and black. 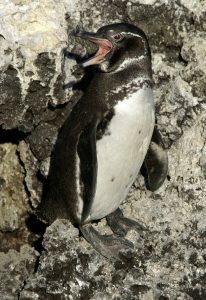 The Galapagos penguins live for 15 to 20 years in the wild. They are endemic to the Galapagos Islands in the archipelago, right on the equator. 90% of the population breeds primarily on the Fernandina Island and the western coast of the Isabela Island. Some individuals also occur on Bartolomé, northern Santa Cruz, Santiago, and Floreana. Generally, the penguins inhabit the caves or crevices of old lava flows and in cracks, burrows and depressions, mainly close to the shore, where they get cool, nutrient-rich oceanic waters. 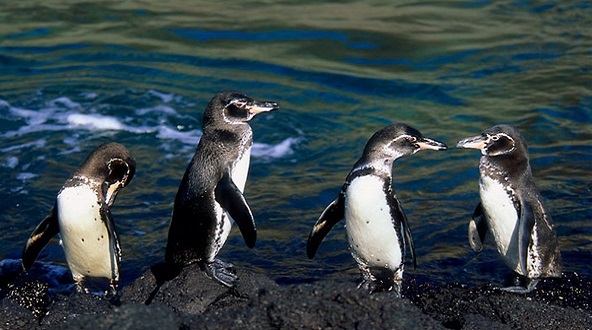 The Galapagos penguins have a routine. They leave their burrows with the rise of the sun and move around the sea coast in search of food. This behavior is also for cooling themselves. They play all day in the waters, and get back to their burrows by sundown. These penguins are colonial and tend to be together in groups. They spend a lot of time socializing with the individuals in their groups. By living in big colonies, these creatures get the advantage of group hunting and dissuading their predators. They communicate with each other mostly by emitting calls and body movements, e.g. wing-flapping that help deterring predators from snatching their eggs. The strong sun in the equator is one of the foremost problems for these small birds. 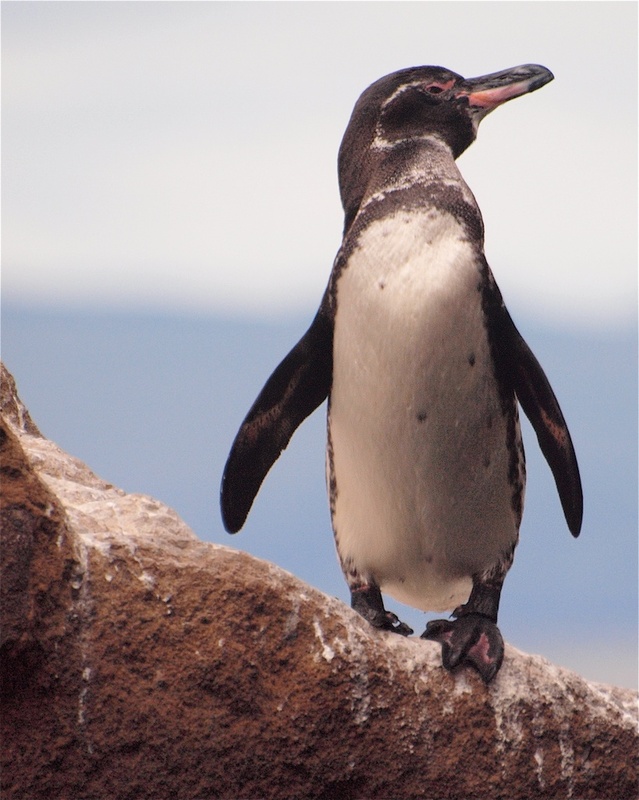 Nevertheless, Galapagos Penguins do not migrate. They remain close to their breeding islands round the year. Their primary way to cool off is going to the sea. They spend most of their time in the day searching for food. As a result of their small wings and short legs that provide them little balance, these penguins are not much comfortable on land. These birds emit series of calls and sounds, especially for communication purposes. Vocalizations are also important in helping them identify their chicks and mates, as also for general communications like greetings or displaying personal emotions. The birds are carnivorous. They primarily survive on small fishes like mullet, anchovies, sardines, mullets, etc. Other marine creatures like small crustaceans, mollusks, zooplanktons and krill, and larger organisms including squid also form a large part of their diet. The males of these Galapagos birds reach the age of sexual maturity between age 4 and 6 years, while the female between 3 and 4. They can reproduce up to three times annually, but they would not breed if conditions are threatening. They usually breed when the sea surface temperature is below 24°C (75°F) that results in more supply of food for them. These birds undergo molting prior to breeding. During this time, they avoid water. 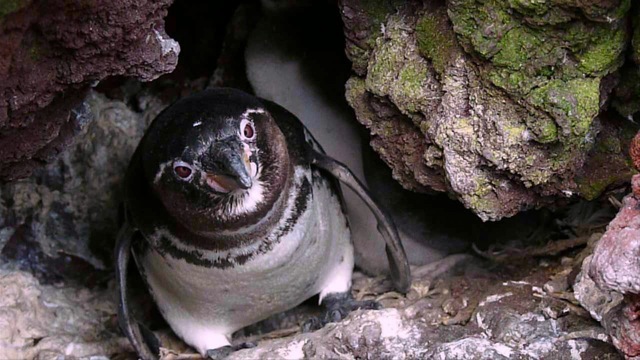 Though, there is no specific time for these penguins to breed, but their nests are usually seen between the months of May and January. 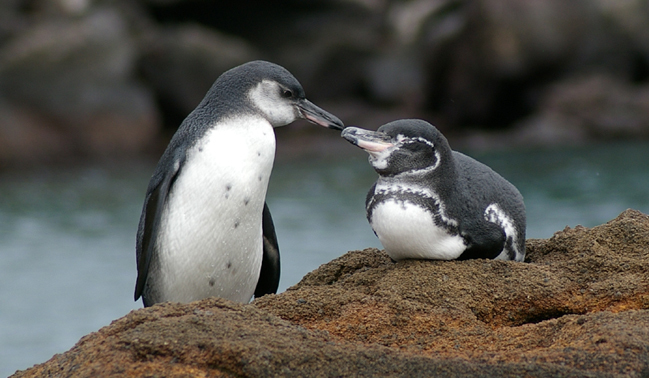 The penguins bond with their partner for life and are monogamous. During mating, they heavily rely on bodily gestures and postures for advertising their sexual status, whether an individual has a mate or is single. After mating and successful breeding, the female would generally lay two eggs. 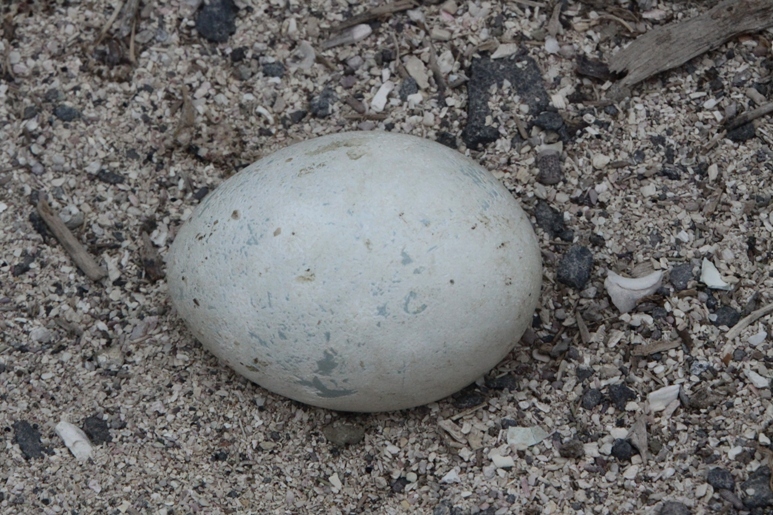 The eggs are laid 4 days apart inside a rock crevice or a cave in order to protect them from the scorching sunlight. Both the father and the mother incubate their eggs with daily change-overs. 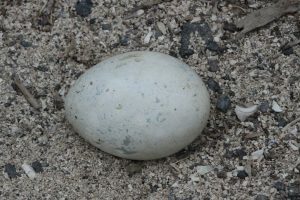 The incubation period is 38-40 days, after which usually one of the eggs hatches. The chicks would take around a month’s time to grow their feathers. 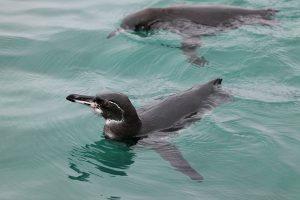 The parent penguins would bring food to the young for about 65 days and are fully independent between 3 and 6 months. But, for about a year’s time, the juvenile penguins are constantly protected by either of the parents, as the other one leaves for food. During the warmer months, the birds use methods of thermoregulation on land. They stretch out their flippers while standing, in order to resist the sun from shining on their feet. Because these birds often stand with stretched flippers, they are also vulnerable to losing heat from them due to the blood flow there. To cope with heat-loss, these penguins also pant using evaporation for cooling their throat and the airways. When they are standing on land, they tend to take a typical hunched posture. This behavioral adaptation also protects their sensitive feet by providing shade from the scorch of the sun. Galapagos penguins protect the eggs and the babies from the blaze of the sun by keeping them in deep and shady rock crevices. When the chicks develop feathers, they are brown above and white below. These feathers are adapted for protecting them from the strong rays of the equatorial sun rather than keeping them warm. As the ocean’s surface temperature rises, the water becomes poor in nutrients. This results in food shortages. During these periods, known as El Nino Southern Oscillations (ENSO), the birds will postpone breeding completely until conditions become favorable again. The Galapagos penguin is an agile swimmer. This helps it move away fast from its marine predators. Pair-bondings are long-lasting, and this allows rapid reproduction when conditions become favorable. 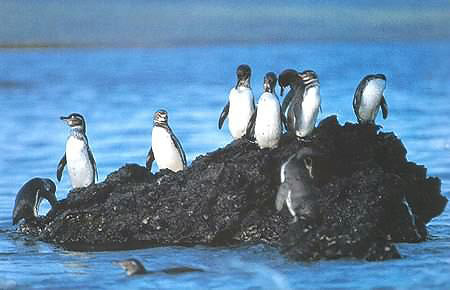 Owing to their small size, the Galapagos penguins have a pretty large number of predators, both in the water and on land. 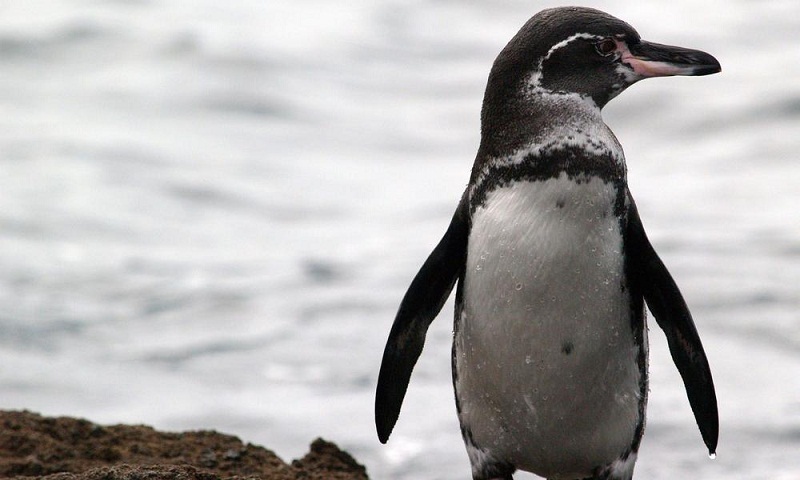 Land animals like crabs, snakes, rice rats, cats, owls, hawks, and even domestic dogs pose a threat to these penguins. In the water, marine creatures like sharks, sea lions, fur seals feast upon them. The Galapagos penguins are an endangered species. The IUCN 3.1 has classified them under the ‘EN’ (‘Endangered’) species list. The Galapagos penguin is the rarest species of penguins, a status that is often falsely attributed to the yellow-eyed penguin. The population of these creatures fluctuates prominently under the influence of El Niño on such intensity that, the future survival of the species is endangered. In captivity, the first successful breeding of the Galapagos penguins was done by Bermudian naturalist Louis L. Mowbray. Presently, the population of the penguins is gradually recovering from an alarming decline of over 70% in the 1980s. These penguins are so monogamous that they reinforce pair-bonding by constant allopreening and bill-dueling with their competitors. These penguins can dive up to 30 meters (98.43 feet) under water. The males are larger than the females.